Chinese Defence Minister Liang Guanglie headed home from Hanoi today after attending the Association of Southeast Asian Nations Defense Ministers' Meeting Plus (ADMM-Plus). Liang’s visit was in part seen by Chinese officials as an opportunity to elaborate on China’s vision for defence co-operation in the region, as well as its military policy more generally. Speaking yesterday, Liang stated that his country’s defence policy is indeed defensive in nature, and he said it was important that countries in the region strengthen co-operation on non-traditional security challenges, including natural disasters like tsunamis and earthquakes. According to the official Xinhua News Agency, Liang called on other nations ‘to press ahead with practical cooperation in a steady manner’ and to keep regional security cooperation on the right track. He was quoted as saying that the ADMM-Plus provides ASEAN and its partners with a new platform ‘to strengthen security and defence cooperation, and promote regional peace and stability’. More interesting than the official speech was Liang’s apparent efforts to smooth ties bilaterally with key players in the region, including Japan and the United States. A meeting that came on the back of a troubled summer in which China was barely out of the regional headlines over its expansive claims to the South China Sea and a spat with Japan over a detained fishing captain had the potential for the kind of frostiness seen at the Shangri-la Dialogue in June. There, US Defence Secretary Robert Gates gave a combative address after having just been snubbed by Beijing during his tour around the region. The snub prompted much speculation that the PLA was calling the shots (a theme taken up by Gordon Chang and Madhav Nalapat more recently in The Diplomat), and although Liang’s invitation in Hanoi for Gates to visit China is only a step, it’s still a very welcome one. The invitation came after China had halted top-level military contacts with Washington at the start of the year following the US announcement in January of a multi-billion dollar arms sale to Taiwan. The decision was, I think it’s fair to say, an over-reaction to a sale that was long known about and which came after Barack Obama had bent over backwards to accommodate his host’s wishes on a trip to Beijing late last year. It was also self-destructive—China looked stroppy, and it’s anyway in no-one’s interests, China’s included, for the region’s two big defence powers not to be talking at the highest levels. ‘Relations between Beijing and Washington have also soured over US-South Korea military exercises in the Yellow Sea, as well as the US' support for Southeast Asian countries' territorial claims in the South China Sea. 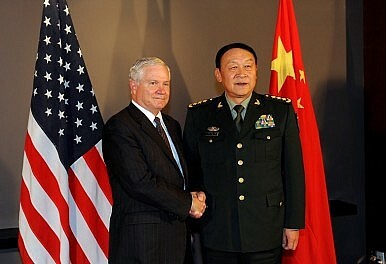 It’s an encouraging sign therefore that Gates has, according to Guan Youfei, deputy director of the external affairs office of China's Ministry of Defence, accepted the invitation to visit China next year, a trip that will likely be his last there as defence secretary if he steps down in 2011 as expected. It’s also encouraging that tensions appear to be easing between China and Japan following the row over disputed islands. As the Asahi Shimbun noted this week, the meeting between Japanese Defense Minister Toshimi Kitazawa and Liang in Hanoi was the first time the two had met since tensions flared following the arrest of a Chinese fishing vessel captain after his boat collided (the Japanese said deliberately) with Japan Coast Guard vessels on September 7 near islands known as Senkaku in Japan and Diaoyu in China. It’s again difficult not to reach for the words self-destructive, with China’s overbearing response to the issue making it look like a regional bully and almost certainly pushing Tokyo closer to the United States, which in turn felt compelled to reiterate its support for Japan. I asked Shogo Suzuki, a lecturer in Chinese Studies at Manchester University, for his take on how much long-term damage may have been done to relations between the two. He told me that Japan is bound to look to strengthen its strategic ties with the United States while paying closer attention to China’s growing military and economic power (although he added that Japan had already been doing this). A related question is whether Japan, which is technically barred by its peace constitution from holding an offensive military capability (but which has an extremely capable ‘defence’ force), will respond with any kind of beefing up of its own forces. After a year of tension with its neighbours, is China starting to soften its foreign policy and military tone?